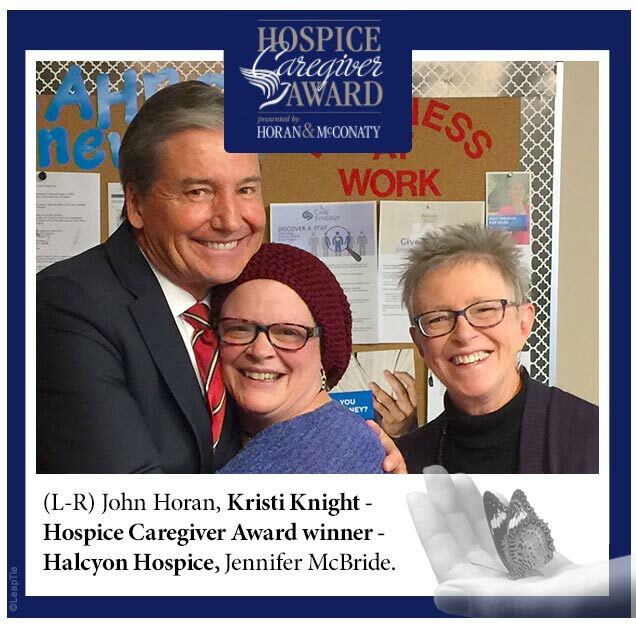 Kristi Knight is the winner of the Hospice Caregiver Award presented by Horan & McConaty. She was nominated by Sharon Wharton. It is my pleasure to nominate Kristi Knight for the Hospice Caregiver Award. I have worked with Kristi for over a year, and she continues to inspire me with her kindness, generosity, and strength in leadership. But of all the wonderful things I could say about her, what really stands out is the way she makes you feel when you’re the lucky recipient of her attention and care. Even when things are hectic at work, when you come to her with a need, she gives you her full presence and you feel important, valued, and cherished. She continually responds to the changes within our organization with grace and humor, but most of all with a team-based perspective. Each member of our team knows that Kristi will listen and respond to their needs, and act on their behalf if needed. Knowing she’s there for us means we have the confidence to act on our values in our work. When we are empowered to be our best selves, our patients and families are better cared for. Kristi’s dedication to her work is truly inspiring, and I know I speak for many others when I say that she exemplifies the heart of Hospice care.